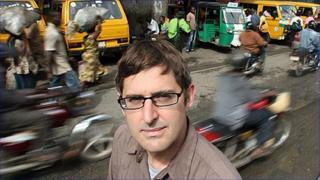 Louis Theroux investigates just who wields the power on the streets of Lagos in Nigeria - and it's not the police. By the standards of Lagos the house is palatial. Set over three floors, it stands behind an electric gate protecting the shiny new cars parked in the drive, one of them a Hummer. Inside, the walls are hung with large photos in gilt frames depicting the owner, a handsome young Nigerian. In several he stands next to famous city dignitaries. Elsewhere there are flat-screen TVs, marble-tiled walls, even a small private mosque. But if anything gives the sense of someone with a taste for the finer things in life, it's the collection of designer shoes in his penthouse suite, 50 or 60 pairs filling one corner. The man whose house it is goes by several monikers, the simplest being "MC". On a tour of the property, accompanied by MC and his enthusiastic young aide Mammok, I remarked on the abundance of shoes. "He's a very fashionable person," says Mammok, as MC nodded approvingly. "And he does his shopping in Italy." Considering his glamorous and upscale existence, MC's day job is surprisingly prosaic. Officially, he is an executive in the city's transportation union. With between 15 and 17 million residents - most of whom do not own a private vehicle - Lagos's buses are its lifeblood. Each bus conductor has to pay union dues every day for the right to use the bus parks, as do the city's thousands of motorbike taxis and other commercial vehicles. This money is handled by the union, of which MC is the Lagos State Treasurer. This on its own would guarantee MC a decent income. But in the area of Lagos over which MC has direct control - a rowdy, bustling district called Oshodi - he is much more than simply a union boss, something closer to a king - raising unofficial and semi-legal tolls on all those who want to do business, and ruling it, so the stories go, with an army of battle-ready youths. I'd got to know MC as part of a documentary called Law and Disorder in Lagos, in which I was hoping to understand how power is exercised and order kept in one of Africa's most chaotic big cities. For me, MC seemed an exemplar of a certain kind of charismatic and informal authority, and I was trying to understand the man and the source of his power. Of his glamorous, celebrity-type existence, there was much evidence. Always decked out in fashionable clothes, a hat cocked at a jaunty angle, he'd arrive at a smart social function, or possibly a celebration at a local mosque, donate thick wads of cash. Then he'd leave amid a mini-riot of local youths, all clamouring for a glimpse of the man and, if possible, a hand-out. MC's generosity was legendary. Indeed, one member of his entourage was a Nollywood [the term for Nigeria's domestic film-making business] actor of some fame - on MC's payroll, seemingly, because he was having difficulty finding work. What was harder to see and understand was the use MC made of the armies of semi-employed youths, known as "area boys". Though MC was an elected official in a legitimate institution, it was widely understood that his position in the union owed as much to his ability to control the streets and command the respect of local toughs who would do his bidding. Within his domain it was hard to overestimate the power of MC. He was even rumoured to have the ear of the Lagos top man, Governor Fashola. One afternoon, MC's aide Mammok agreed to show me around the area MC controlled. He pointed out a pair of young men entrusted with taking cash from motorbike taxis. One obligingly showed me the day's takings, a wad folded in his palm. Then he introduced me to a woman stall holder selling a small pile of goods on a blanket. When I asked if she knew MC she looked rather frightened and shook her head. "It's more of a political thing," says Mammok, explaining her reticence. "You wouldn't expect her to tell you that. They have to play politics." I'd been told that one of the services MC provided to the business-owners on his patch was "protection". But protection from whom? "The police cannot harass them," says Mammok. "That is the primary thing. Sometimes - all over the world - the police can be very very overzealous." As time went on, and I came to know MC and his organisation better, I got more of these glimpses of the shadowy, less strictly legal side of his world. As it happened, a few days into my visit, MC's status as union treasurer was challenged by political rivals and he was forced to call an election to reaffirm his position. On the day of voting, I turned up at the polls to find a ragtag army of MC's supporters, some holding broken bottles, with blood running from fresh cuts, as they jogged along behind his four-by-four in support. Skirmishes were reported - an opposition gang was rumoured to be in the area - which may explain why someone began firing a shotgun from MC's car. And yet the whole election had a touch of absurdity to it, given no other candidate had the courage - or possibly the opportunity - to come forward. MC had run unopposed. I relaxed afterwards at the victory celebrations, which were no less jolly for having been a foregone conclusion. Police in uniform drank beer and one drunkenly fired his pistol in the air. Mammok was - understandably - protective of MC's reputation and not keen to talk about the occasional need to rely on street violence or the details of a business that, viewed unkindly, was a glorified protection racket. "The ways of the Caribbeans are not the ways of the Americans," he says when I probed him on the subject. "It has become like a way of life in this part of the world." When I asked him if it seemed a good system to him to have someone in charge of an area holding a king-like sway over his private fiefdom, he compared MC with the Queen of England, suggesting MC was not so different. The truth is, in my time with him, I'd grown oddly fond of MC. Granted, the occasional street brawls and the lack of accountability might be taken as a frightening and perhaps depressing symptom of the weakness of the social contract in Lagos. But in the absence of dependable police, MC and his boys did actually seem to do the job of keeping law and order - up to a point anyway. For now it may be that in areas like Oshodi, MC and his brand of area boy-based authority are the best they can hope for.